The Leatherique Rejuvenator Oil is designed to help condition your leather so it stays looking great for years to come. When leather looses some of it's natural properties it may become less flexible and dry. Leather that becomes dry can not stretch and flex as it should when passengers get in and out. This can lead to the leather cracking, wrinkling or becoming tattered. If you have faded, dry, tattered, dirty, discolored, cracked or otherwise imperfect leather than you need the Leatherique Rejuvenator. This amazing product gives your leather the deepest conditioning possible to restore leather not thought salvageable. The Rejuvenator restores leather by first using its unique capillary action to force proteins back into the leather while at the same time releasing contaminates that are embedded in the leather. The secret to the Rejuvenator's outstanding results is its unique formula, which uses a complex blend of animal proteins, collagens, and no fillers. This formula is great for restoring leather and for regular maintenance. Give your leather or leatherette the fine treatment it deserves with the Leatherique Rejuvenator. With regular treatments you can keep your leather soft yet durable. 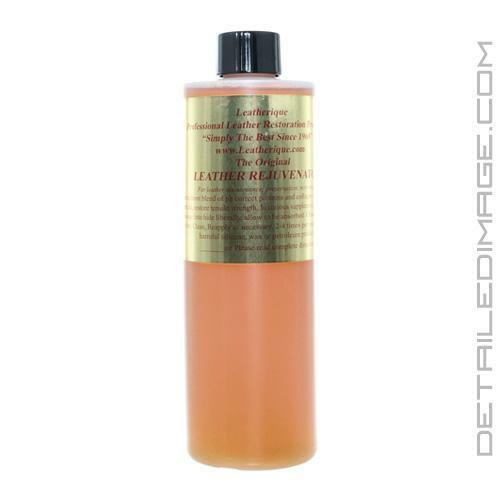 Leatherique recommend you use the Leatherique Prestine Clean after for best results. Leatherique always perform[s] very well with the more challenging leather restoration jobs. An emollient blend of ph correct proteins and collagens formulated to penetrate, restore tensile strength, luxurious suppleness, and expel dirt. Massage into hide liberally, allow to be absorbed. Clean surface with Prestine Clean, Reapply as necessary, 2-4 times per year. Contains no harmful silicone, wax or petroleum products. Absolutely love the leatherique product for restoring leather. Have used on a dozen applications and get great results every time! Apply following the esoteric YouTube video instructions for best results. Used the product as described, actually took it one step further and followed the detailer instructions on the web site which is a little different, esp. removing product. I applied with hand but detailer gave an option of a soft foam painters brush, which is a great idea. Used on a 92 SAAB with seats that probably never seen any conditioning or cleaning. Leather was pretty stiff and dirty before treatment. I let the product sit a few days in the hot AZ sun. Used cleaner, sprayed directly on seat, wiped down with microfiber and then warm damp microfiber towels to remove. It does get sticky but for me easily removed. I sprayed seats twice, also with damp towel. Rinse towels as directed...Overall seats are better but not brand new soft leather. It did slightly soften...Leather is clean. 3 treatments per 16 oz bottle I did 2. Sun here really dries up seats so I didn't expect baby smooth leather. I really don't think there is anything else out there that will work. Would recommend. I have used this product many times and referred several other owners to use this product with assurance this product would rejuvenate the leather!